Waikanae (English pronunciation: , Māori pronunciation: ) is a small town on New Zealand's Kapiti Coast. The name is a Māori word meaning "waters" (wai) "of the yellow-eyed mullet". The township lies about 60 kilometres north of Wellington: New Zealand's capital city; between Paraparaumu, eight kilometres to the southwest, and Otaki, 15 kilometres to the northeast. Another settlement called Waikanae Beach exists near Gisborne on the east coast of the North Island of New Zealand. Kapiti Island seen from Waikanae Beach. Waikanae lies in a setting of open farmland and forest between the Tasman Sea and the rugged Tararua Ranges. Together with its neighbouring settlement of Waikanae Beach, the township comprises a quiet locale, popular with families and retirees. Just north of Waikanae is the small community of Peka Peka. The area surrounding the township is notable for its 5-kilometre long beach and its wide river mouth opposite Kapiti Island, which lies four kilometers offshore in the Tasman Sea. 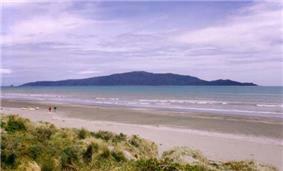 The Kapiti Island Nature Reserve includes the Waikanae Estuary Scientific Reserve. The Te Araroa Trail leads through Waikanae. The waters between Waikanae Beach and Kapiti Island comprise the Kapiti Marine Reserve, with whales and Hector's dolphins sometimes spotted on their migration routes through the narrow corridor. Inland, behind Waikanae, are the bush clad Hemi Matenga Reserve, the Tararua Ranges and the Akatarawa Valley, home to a popular conservation park, Staglands Wildlife Reserve. A road through the valley over the Akatarawa Saddle provides a link with the Hutt Valley via Reikorangi and Cloustonville. 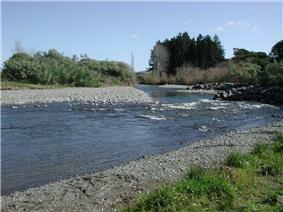 The headwaters of the Waikanae River form where a number of streams converge in the inland Reikorangi Basin. From here the river runs through a gap in the foothills, across the coastal plain and sand dunes to the sea. Prior to human settlement the Waikanae coastal plain comprised wetlands divided by a complex pattern of natural waterways and kohekohe wooded regions. Wetlands remain a diminishing feature of the region but the development of numerous private gardens has led to Waikanae having one of the highest levels of water consumption per head of population in New Zealand. The community draws its water from the single source of the Waikanae River, and seasonal shortages during the warmer months of the year constitute a growing problem for the township. Waikanae Beach is populated by terns, seagulls, oystercatchers, and stilts. Inland wetlands provide refuge for pukeko, crake and New Zealand dabchicks. White fronted herons and shags range across the coastal plain. The ready availability of both birdlife and seafood encouraged early Māori settlement of the area. Introduced species such as ducks and black swans have also flourished over the last century. 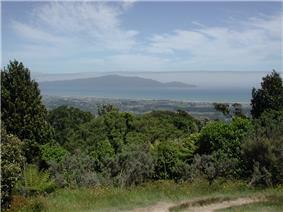 Waikanae is backed by the heavily forested 330-hectare Hemi Matenga Reserve covering a range overlooking the township. Rising to 514 metres above sea level, the forest comprises one of the most extensive areas of kohekohe woodland left in New Zealand. The reserve is named after its former owner; Hemi Matenga Waipunahau of the Ngati Toa. It is traversed by several walking tracks and forms an extension of the Tararua Range. Waikanae seen from Hemi Matenga Reserve. Archaeological and ethnographical research suggests that Waikanae may have been first inhabited by the Waitaha moa-hunters as early as a thousand years ago. Successive waves of settlement by the Ngati Apa, Rangitane and Muaupoko tribal groups ensured that the area continues to have major historic and mythological significance for the Māori people of New Zealand. See Kapiti Coast for greater detail. The 2013 New Zealand Census records the usually-resident population of Waikanae and Waikanae Beach combined as 10,630. It is forecast that Waikanae's relative abundance of unoccupied land and recent or pending improvements in transport links will lead to a population increase to about 15,000 by 2032. The most recent census with fully published returns (2006) records that 35% of Waikanae's population were 65 years-of-age or older, many of them living in retirement villages (grouped housing units in garden settings). The central Waikanae Village includes two supermarkets, the Mahara Art Gallery, a health centre, two pharmacies, a community police station, craft shop, a post shop, a war memorial hall, a smaller community hall, a small museum, church, library, cinema and a number of other shops and restaurants. Nearby are the Nga Manu Nature Reserve, two primary schools, a golf course, bowling club, Waikanae Park cricket ground and several retirement centres. The Tararua Range provides shelter for Waikanae from the south and east, as does Kapiti Island from the west. The area accordingly escapes the heavy winds and storms of the neighboring Cook Strait region. The shallow depths of Waikanae Beach produces a higher water temperature than the steeper coastlines of Wellington harbour to the south. The prevailing wind blows from the north-west, which drives rain-clouds inland to the ranges and results in high rainfalls during the winter and spring. 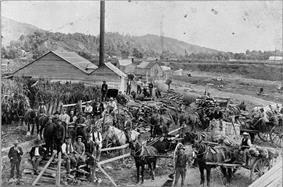 The town is located on State Highway 1 and the North Island Main Trunk Railway. As of 2014 a diversion is under preparation to enable State Highway 1 to by-pass the centre of the township. Until 2011, the only direct commuter train to Wellington was the Capital Connection from Palmerston North which leaves for Wellington in the morning and returns in the evening en route to Palmerston North. However, in February 2011 the electric rail commuter-service from Wellington was extended by the operators Tranz Metro to the newly rebuilt Waikanae Railway Station. The new Matangi electric multiple units entered service on the Kapiti Line in 2011. Local bus services link Waikanae Village with Waikanae Beach and Otaki. A radio station Beach FM 106.3 broadcasts from Waikanae Village, covering the Kapiti and Horowhenua districts. Two local newspapers provide coverage of the Kapiti region. ^ N.Z. Department of Conservation publication "Hemi Matenga Memorial Park Scenic Reserve"